Chicano Park in San Diego's Barrio Logan neighborhood is home to the largest collection of outdoor murals in the United States. Josephine Talamantez remembers the day she and many of her neighbors in San Diego’s Barrio Logan neighborhood were nearly arrested: April 22, 1970, the official launching of Earth Day as a national holiday. But that park, now known as Chicano Park, was created anyway. Containing picnic areas, gardens, playgrounds, a dance pavilion, and—most notably—the largest collection of outdoor murals in the country, it was designated a National Historic Landmark in December 2016. This new status is a profound victory for the community, which fought hard for the park, says Talamantez. A predominantly Mexican-American neighborhood since the early 20th century, the area now called Barrio Logan was rezoned from residential to mixed-use in the 1950s, allowing for more industrial activity. Hundreds of families and small businesses were displaced. In the 1960s, construction of Interstate 5 and the San Diego–Coronado Bay Bridge bisected the neighborhood, leading to even more displacement. Those who remained campaigned for green space on the only available land—under the bridge. In 1969, the city agreed to a park. The residents waited. Then, on that inaugural Earth Day, local college student Mario Solis saw bulldozers at the designated parkland, there to create infrastructure for a new California Highway Patrol substation—not the promised park. Solis ran through the streets, alerting his neighbors to the development. “I guess you could call him our Chicano Paul Revere,” Talamantez says. Barrio Logan residents staged peaceful protests. They occupied the land, forming human chains, blocking construction equipment, and planting gardens. Some protestors, including Talamantez, created the Chicano Park Steering Committee to lead negotiations and steward the land. The occupation lasted 12 days. After extensive talks with the city, Chicano Park was born. Soon after, the bridge pylons towering over the park were incorporated into its design: Renowned artists such as Salvador Torres, whose family’s house was demolished during the freeway construction, and Victor Ochoa, an early member of the Chicano Park Steering Committee, reimagined the pylons and recruited other artists to help, painting them with colorful murals depicting various elements of Chicano culture. 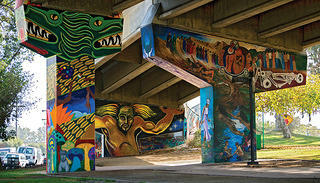 Today, Chicano Park continues to be a beloved gathering place. Next up is securing space for a museum and cultural center on site, further documenting the community’s contributions to greater San Diego. That’s at the heart of what Chicano Park stands for, says Talamantez, whose family has lived in the area since 1906.